On Thursday, 24th March 1932 the Orange Rotary Club was conceived, an event that had future ramifications to the people in Orange and the surrounding district for the many years ahead. The District Governor of Sydney area (District 76), Mr F R Burley, accompanied by Bishop Crotty of Bathurst and Archdeacon H S Needham of Orange, met with Dr A E Colvin, Dr J T Paton, Messrs. T E Palmer, W E F Satchell, A R Campbell and J S Douglas for this historic meeting at which Dr A E Colvin was elected President. 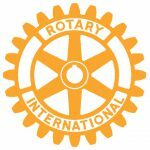 District Governor Burley told the Club on Thursday 9th June 1932 it was now a Charter Member of Rotary International and District 76. On 10th December 1932 Charter No. 3517 was duly presented to President Dr A E Colvin, and the other 30 Charter Members, at a large gathering held at the Royal Hotel, Orange. Thus the Orange Rotary Club became a member club of District 76. There were 31 Charter Members present and it is fitting that their names be recorded for posterity. Early history seems to indicate that the Rotary Club of Orange met at lunchtime for some years until the 25th Anniversary when it became apparent that Monday was the meeting night. The club has adhered to that evening despite changing venues over the years. In the last 30 years the Club has met at the Canobolas Hotel, the Ex-Services Club, the PATMOS Restaurant, the Apple City Motel in Bathurst Road and currently at the Ex-Services Club. The Club had a creditable record of sponsoring a new project each year and of continuing on-going projects from previous years. Among these projects were the Fairbridge Farm Annual Ball held for many years, the entertainment of Asian students on numerous occasions, the regular sale of Christmas trees in aid of the then two local orphanages and the annual visits of the group of Californian farmers, known as the Calfarm Project. Although these are no longer current projects another on-going project since 1980 has been the very successful Sunday Market, held in the Kmart Car Park. In 2009 a new initiative was the successful Environmental Expo Project. As Orange progressed from a town to a city in 1946, there was a greater need to promote Rotary to the increasing population and one of the Club’s greatest strengths has been its sponsorship and activities in various other Rotary activities, namely Rotary Foundation, Group Study Exchange, Rotary Overseas Vocational Exchange, Youth Exchange, Rotaract and RYLA. The Club was proud to be associated with the formation of two other Clubs within the Orange district – Blayney (1955) and North Orange (1970). A number of members from the Orange Club transferred to North Orange to ensure its success. Among these were Orange North’s first President, Fred Rudwick along with members Dave Brown, Ron Cazey, Bernie Huxtable, Orm Johnson, Chris Lambrechtsen and George Seymour.